This orange carrot salad has a mixed taste- tangy because of the oranges and sweet because of the dates. Orange lovers will love this salad. 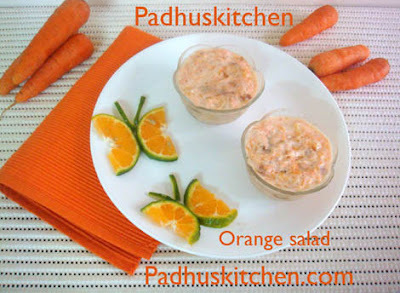 Let us learn how to prepare this easy orange carrot salad following this easy carrot orange salad recipe. How to prepare hung curd? Tie curd in a muslin cloth or cheese cloth and hang that for 4 hours to drain all the water.You can drain the water over a sink or bowl. Mix everything together,add salt and pepper powder to taste. That's a wonderful salad...bookmarking it. Lovely salad....love all the Ingredients used in it ...yum! Wow wat a beautiful salad, lovely combo. What a lovely, refreshing salad. Looks so healthy and delicious. woww,such a healthy n lovely salad!! woww..luks colourful n good presentation. Super cool. My previous post was something related to this. Yummy! Wow, that's a healthy n delicious salad..loved it!! Lovely, nutritious and healthy salad dish. Very healthy and yummy salad. Lovely presentation.